Okay so you may need to get yourself a cuppa for this one because this is going to be long. I tried to split this post into 2 halves so you didn’t die of boredom reading this but I just couldn’t decide what to group together because I’ve used that much stuff! I don’t even know how I’ve accumulated this many empties because it hasn’t even been a month since I posted my last one. I’ll try and be as brief as I can about each empty so I don’t waffle on for days but if you have any questions about a specific product just ask me in the comments below. So from the end of March it appears I’ve used up an abundance of shower gels. As in 4 in under 4 weeks! First up is this Lush Special Edition from their 2016 Halloween Collection. This is a brilliant unisex scent so I have been using it at Josh’s flat so he can use it too if he wants. It has quite a spicy undertone and probably would be more suitable for the colder months but never mind! If you want a shower gel where the scent stays with you all day then this would be a great one- it’s also bright green so that’s also kinda fun. Would I repurchase? I probably would if they re-released this later in the year but for now I have plenty to be getting on with using and it isn’t currently available in stores anyway (although I believe you can get it online). This is an oldie but a goldie, I’ve been using this for as long as I can remember, you can pick it up on offer all the time for £1 and it smells sweet enough to eat. 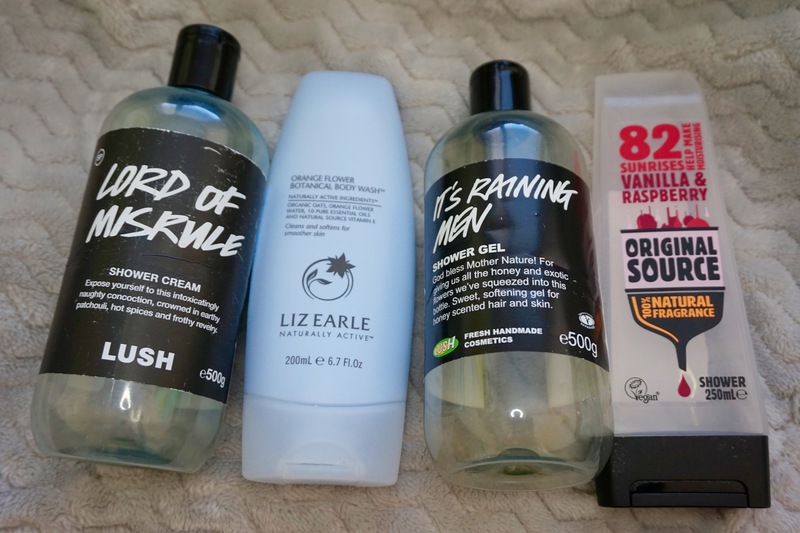 This shower gel is vegan so is great if you’re trying to go cruelty free on a budget and their range has loads of other scents you can try out if you prefer something a bit more fresh. Would I repurchase? Definitely, I have done repeatedly so I can’t see that stopping anytime soon. I received this one free as a gift with purchase when buying my cleanser a while ago. This has a strong citrus scent so is great for a morning shower to wake you up, it is also quite a thick formula so a little bit goes a long way. Would I repurchase? If I received it as a gift in store again I would 100% use it but I wouldn’t go out of my way to buy it as it’s just not my usual sickly sweet smell but it is a really great product. This may be my favourite ever Lush shower gel and that’s saying something because I’ve tried a few! The honey in it makes it really moisturising and it smells beautiful (exactly like the Honey I washed the Kids Soap)- this would be great for sensitive skin or children and the large size bottle has lasted me forever! Would I repurchase? 100% yes. This is the second bottle of this scrub that I’ve used and it is really good if you want a relatively harsh exfoliator. It doesn’t damage or scrape your skin but it will get rid of any dry areas or a build up of fake tan. It has a nice fruity citrus scent so is great for the summer months. Would I repurchase? Probably if my skin was wanting a bit of TLC or I had a fake tan fiasco, it’s quite cheap for how long each bottle lasts too! Love love love the smell of this one- it lingers all day and it smells exactly like Limes. I am a huge fan of Soap & Glory moisturisers as you can really feel them working and making a difference to your skin. If you aren’t a fan of limes avoid this line as the smell can’t be mistaken for anything else. Would I repurchase? 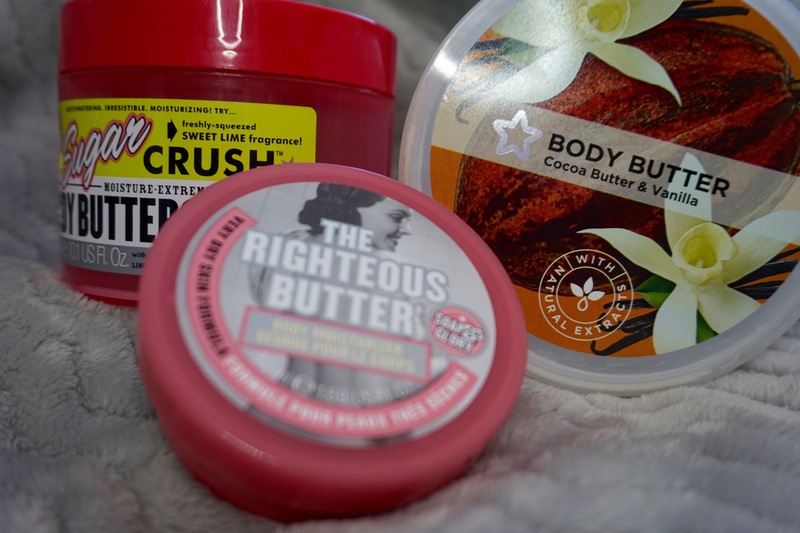 Yes after I’ve used up my other body butter’s definitely. I was pleasantly surprised by this one, I picked it up on a whim a while ago whilst it was on offer just to try and it and it smells gorgeous. Anyone wondering how I’ve managed to go through so many duplicate types of products, I keep some things at my boyfriends’ flat for when I stay over so that’s how I’ve ended up with so many. Would I repurchase? Yes, not only is this line really cheap and actually works, it is also cruelty free and marked with the leaping bunny so is a great animal friendly option. Just a little travel size but this used to be my go to body butter and my accidental signature scent. It never gets old and comes in a handy minature version which is great for travel (Note: This works great as emergency aftersun). Would I repurchase? I never have to purchase this body butter as at Christmas I get enough Soap & Glory products to sink a ship in gift sets so I think I’m good. This conditioner has done wonders for my hair. It feels silky soft after I use it and it smells like Strawberry milkshake, what more could you want? Even though this was the smaller sized bottle it has lasted a few months which I was really impressed with and obviously, as with all Lush products it’s cruelty- free. I find haircare the hardest to find affordable cruelty free options for so if anyone has any suggestions please comment what you use. Would I repurchase? Yes as soon as I’ve used up all my other conditioners this is top of my list or maybe I’ll ask for it for my birthday. Liz Earle Botanical Shine Shampoo for all hair types 200ml. This is the shampoo that matches the conditioner from my previous empties post. It smells lovely and kept my hair feeling fresh and soft even in harsh skiing conditions when I first started using it. People always comment on how nice my hair smells when I use this, so that’s always something to consider as well. Would I repurchase? If I wanted a treat purchase then yes as its quite luxurious. This shampoo is amazing if you want to get a bit of volume into lifeless, thin hair. The sea salt gives you natural looking beachy waves and what’s more, it’s vegan! 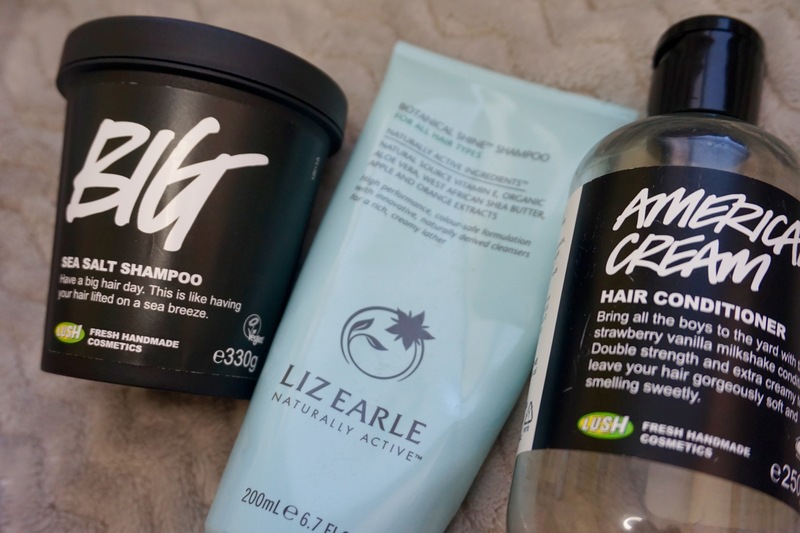 I highly enjoyed using this, although I would avoid if you have very dry hair or are on a beach holiday and don’t want to add yet more sea salt onto your hair. Would I repurchase? Yes this shampoo gives your hair a wavy, summery vibe and also if you collect 5 black pots you can received a free fresh face mask of your choice, so I’ll be saving this pot for a while. I won’t bore you with the details but this is a great, long lasting deodorant that doesn’t leave annoying white marks on your clothes and is really affordable. Would I repurchase? I always have a backup ready for when mine runs out because nobody wants to be sweaty. This is my 3rd bottle of this fragrance and I’ve loved it for years, it’s really sweet and not too overpowering and I’ve worn it since being a teenager. Would I repurchase? No as I already have a lot of perfumes to use up at the moment and also I’m pretty certain this isn’t cruelty- free so I don’t want to keep purchasing it. I won’t lie I use these for wiping my hands when applying makeup or wiping away any eyeshadow fallout before applying my base as I HATE removing my makeup with wipes. 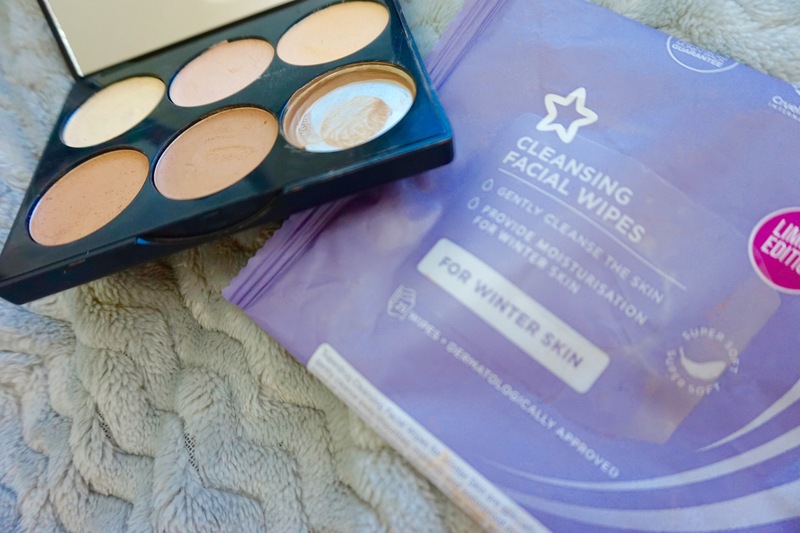 However I did remove my makeup once with these whilst I had eyelash extensions in and they didn’t burn my face like a lot of wipes can do so that’s a bonus. Would I repurchase? If they are still available then maybe I would but I’m not super loyal to brand as like I say I wipe my hand with them- but at least they’re not tested on animals. So this is my only makeup empty and is also a bit of a cheat. I’ve only used up one shade…hear me out. The ashy contour shade is perfect for fair skintones and is really easy to blend and it lasted for months, despite me using it everyday. However the rest of the palette is too orange, I look like I’ve done my makeup in the dark if I use any of the other shades so it is a complete waste of the other 5 shades. Would I repurchase? No as I can only actually use 1 colour. The formula is great so if you have darker skin then go for it but if you are pale I highly recommend swatching all the pans before you buy to make sure it’s worth your money. I’m going to lump these 4 together otherwise you would resent me for having to read the same thing 4 times over. I bought these ages ago whilst in Venice with Sam and thought they looked cool. 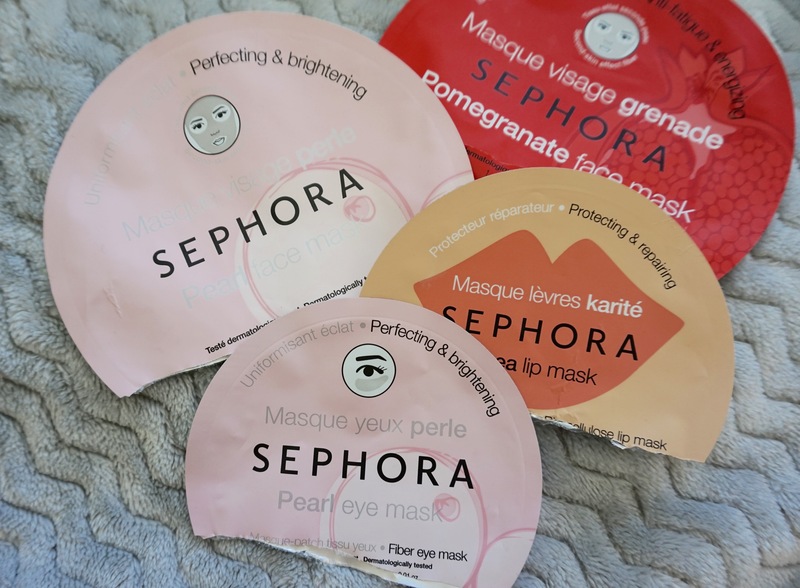 This seemed to be just before the sheet mask trend took off and since then they have been everywhere. My favourites were from the Pearl range as they seemed both moisturising and illuminating. These are reasonably cheap although difficult to get hold of in the UK. I used 2 face masks, one under eye brightening and cooling mask and a lip moisture mask. Would I repurchase? No as they are hard to get unless abroad and also I believe Sephora test on animals so I wouldn’t purchase their own brand again. Finally a couple of non- beauty empties for you. These pillar candles seem to burn forever. This scent is gorgeous it smells just like gelato and sunny days on holiday. The pillar candles also seem to burn more evenly so you actually burn all of the wax rather than leaving that annoying ring around the edge like in the jars. Would I repurchase? Not at the moment as I have far too many candles stored under my bed that need some attention for now. I got these at Christmas and loved them! 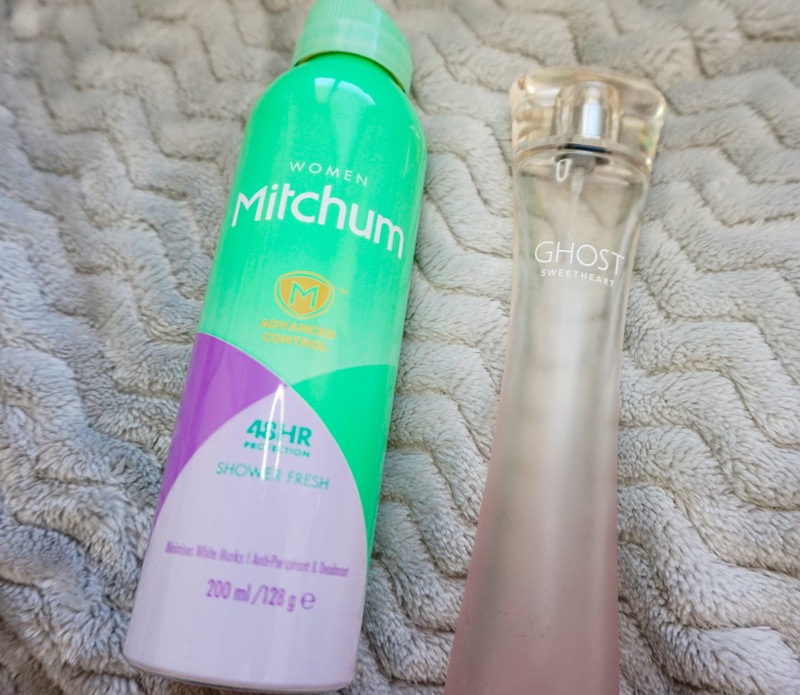 I wrote more about them in my March Favourites if you want to read more. Would I repurchase? 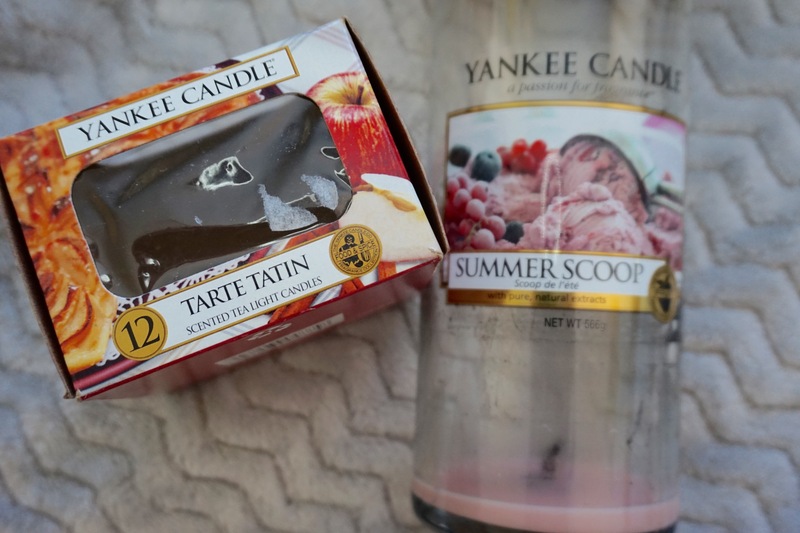 Yes this is a perfect autumn fragrance and the tea lights make your room seem extra cosy! So if you’re still here, Well done you deserve a medal! I am aware this post is ridiculously long but hopefully next month all my products wont all run out at the same time (fingers crossed). Let me know if you have any product suggestions- especially cruelty free options. They’re fab they smell really nice and you can get ones called shower milk which are really moisturising as well! Wow, a lot of good empties! What does that Liz Earle shampoo smell like?